Recently I attended a software testing conference held in Manchester. While I was at the conference I had a conversation with Andrew Morton (@TestingChef) about Twitter. Andrew told me he had a theory that at conferences people tweeted more in the morning than in the afternoon. As an active Tweeter and passionate R user I thought it would be interesting to try collect some real data, take a look and see what was happening. Once the conference was over and I had finished my write up of the event I made a new github repository and started playing around with R. R, sometimes also called Rstats, is a an open source programming language used for statistical analysis and generation of graphics. I wanted to gather up all the tweets about Test Bash Manchester so I could start looking at them. I found that there was an R package called twitteR specifically designed to mine tweets out of Twitter. I went to http://dev.twitter.com and created a new application in order to get hold of a key and secrets so I could start accessing the Twitter API. To get around storing my secrets in plain text in my script (I didn't want anyone to be able to read them straight out of github), I used environment variables to keep them safe. The process of mining tweets from Twitter was quite straight forward. 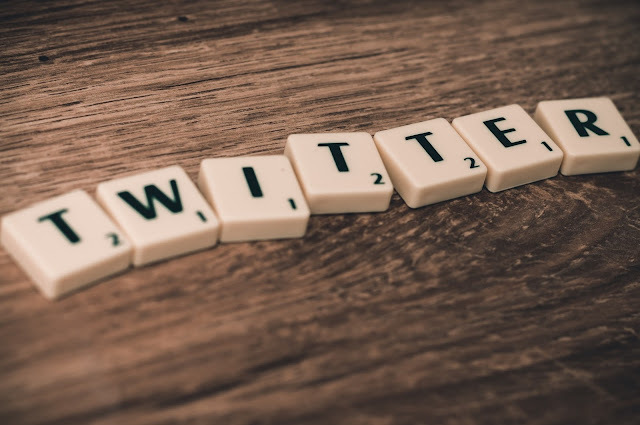 Install the twitteR package, include the twitteR library, give it all the keys and secrets, call a function to authenticate then call another function to search. There was even a nice helper function to convert the big long list of tweet data returned into a dataframe so it could be manipulated easily. Its worth mentioning that the Twitter API does not hold on to all tweets forever. I found that tweets are generally available for about 10 days before they are gone forever. However because R is awesome it is possible to save a batch of tweets that can be loaded and investigated at a later date. On 29-10-16 I mined and saved 2840 tweets tagged #testbash which spanned a period of the previous 10 days covering the day of the conference. I did this by converting tweets into a dataframe and using saveRDS() and readRDS() functions to save and load my dataframe as a .Rda object. The tweets I mined required a little bit of clean up. 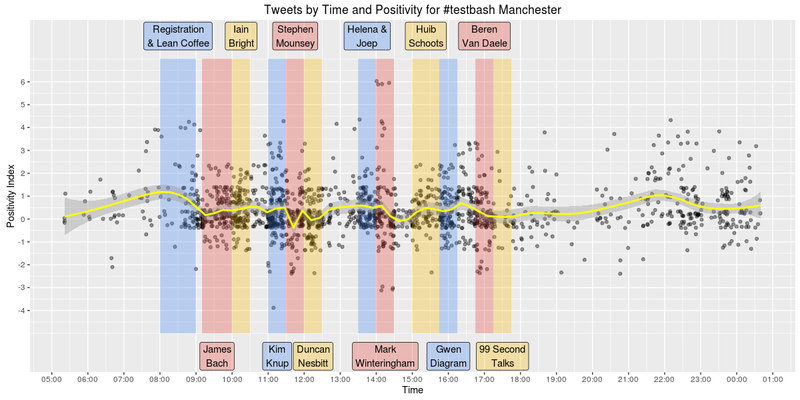 I had mined on the #testbash hash tag which also included tweets about Test Bash conferences in Brighton, Philadelphia and Netherlands so I discarded tweets which were not specifically about the Manchester event. I also only focused on tweets created on 21st October 2016, the day of the conference. It is also worth mentioning that all the tweet data to UTF-8 to resolve problems caused by tweets containing emojis. I used a black line to represent the total tweet frequency and different coloured lines to show the quantity of tweets originating from different platforms. I added annotations to the plot to indicate who was speaking at the time. Straight away it became very clear that there was a spike in Twitter activity during Kim Knup's talk on positivity. This was one of my favourite talks of the day and I'm not surprised it got people talking on Twitter. Tweeting activity can be seen to drop during the breaks and is especially low at lunch time. Possibly because during lunch everyone is focused on eating, not tweeting. The level of twitter activity in the afternoon does not appear to be lower than the level of activity for the first two talks of the day. It is also interesting to see how the number of tweets from Android and iPhone devices starts to fall by 18:00pm. I know the battery in my Android phone was at about 3% charge by 17:30pm which stopped my tweeting efforts. It's also noticeable that there aren't many tweets between 20:00pm and 22:00pm. This coincides with timing of the 2016 Dyn Cyber Attack that brought Twitter to its knees making it too slow to use between 20:00pm BST and 22:10pm BST. Looking at times and quantity of tweets is one thing, but it does not tell us very much about the content of these tweets. I wanted to perform sentiment analysis to dig deeper and try discover more. 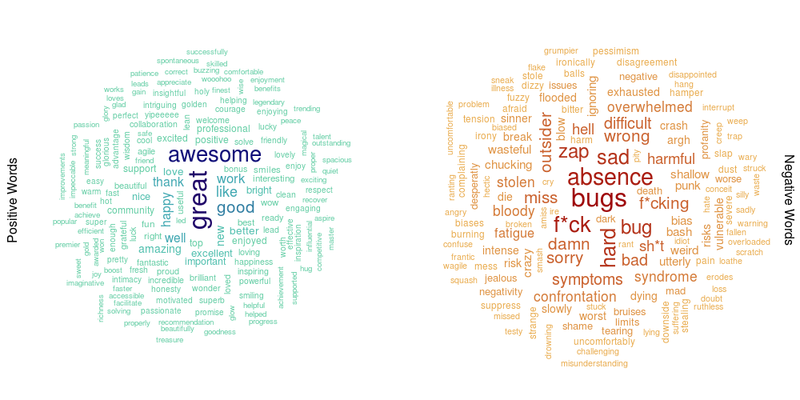 A good place to start with sentiment analysis is to compare the tweets to a lexicon of positive and negative words. Then score each tweet +1 for containing a positive word and -1 for containing a negative word. Adding words specific to the domain of software development e.g. 'wagile' , a negative term used to describe agile development which has reverted back to waterfall. Made some corrections based on context, e.g. I reclassified the word 'buzzing' from negative to positive. Added UK spellings along side US counterparts e.g. 'honour' as only US version 'honor' was present. I also removed all the positive and negative words present in titles of each speakers talk from the word lists. I did this to try mitigate bias as words in talk titles are mentioned more frequently but used to identify talks and do not carry a sentiment. 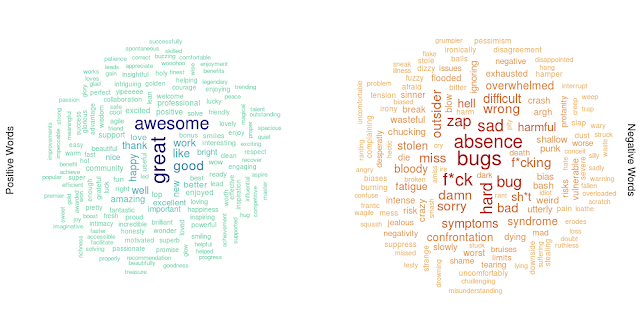 Once I had managed to identify positive and negative words in the conference day tweets, I was able to use this data to draw some word clouds. Please click on the image below to view at full size. I drew two clouds, one positive and one negative. The larger, darker words in the centre appear more frequently than the smaller, lighter words towards the edge of the cloud. Be aware however that people on Twitter do swear and as such any data mined from Twitter may contain profanity. I chose to censor the profanity in my plots with the addition of some strategically placed asterisks. I wanted to plot all the conference day tweets by their sentiment score to see which parts (if any) were especially positive or negative. I was able to do this using a scatter plot. Again, please click the image below to view the plot at full size. This plot uses 'jitter' which adds a small amount of noise to uniformly distributed variables. So rather than having all the tweets with the same sentiment score in a perfect horizontal line, it shakes them up a bit and moves them a tiny distance in a random direction. I also reduced the alpha transparency level for each point on the scatter plot to make it easier to see areas where the tweets were more densely packed. I added a yellow line to the plot which is a smoothed conditional mean using a loess model. This line shows roughly how the positivity levels of tweets change throughout the day. Positivity builds in the run up to the start of registration at 8:00am and remains positive between 0 and 0.5 until around 11:30 when it suddenly drops during Stephen Mounsey's talk. I was curious as to what was being tweeted around this time so I took a look. Seems there quite a few tweets about not listening, this may explain the negativity during this section. Positivity levels also dipped again during Mark Winteringham's talk at around 14:15 I checked the tweets again to see what was going on. Tweets about ranting and what not to do with acceptance scenarios were responsible for lowering positivity levels during this section of the conference. I have made the script I wrote to generate all these plots (along with the Twitter data I analysed) available on git hub for anyone interested in looking at the tweets themselves or building upon the analysis that I did. And now a shameless plug: If you are local to Newcastle and interested in finding out more about Twitter mining and sentiment analysis, I am giving a talk at Campus North on 12th December 2016 as part of the R North East bi-monthly Meetups and it would be great to see you there! I did it! I gave my talk!